When Amanda and I went to see The Civil Wars back in March, I was incredibly impressed with what I heard. I was already pretty familiar with them due to multiple spins of a live recording of theirs that they were offering on their website, but actually hearing it in person was something else. Two voices, one guitar and the occasional piano somehow combined to fill all the spaces usually reserved for a full band. Lots of people sing together but I haven't heard many people sing together as well as Joy Williams and John Paul White do, especially live. They played some great laid back covers of "Billie Jean" by Michael Jackson, "I Want You Back" by The Jackson Five, and "Talking In Your Sleep" by The Romantics and even introduced a new song called "Barton Hollow" that was played on an incredible dobro. 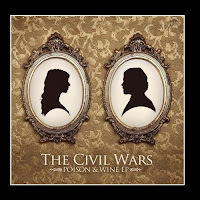 "Tip Of My Tongue" is a really beautiful song off of their only studio release so far, the 4 track EP "Poison & Wine", that showcases their great vocal interplay and John Paul's tasty finger picked acoustic guitar work. Using great jazz voicings that evoke a Parisian side street cafe, John Paul's acoustic bounces just enough to allow Joy's vocals to dance around on top of it. Just like the last time I wrote about them, the lyrics on this one make me want to turn the Casanova on and get all romantic. I love the opening line, "You're a red string tied to my finger, a little love letter I carry with me." Ain't that the truth! Amanda is so embedded in my subconscious that I find myself saying "remember when..." or "you know how..." while forgetting to actually tell her about specific things. It's like I just assume she is always around because in my heart, she is. Everything somehow reminds me of her or makes me think it would be something she would be interested in. She's my own personal red string around my finger reminding me how lucky I am. I also love the line, "You're my favorite song, always on the tip of my tongue." People I work with or go to school with who have never met Amanda feel like they know her because of how much I talk about her. Spend 5 minutes with me and I guarantee you'll get an Amanda story whether you want one or not! The Civil Wars are currently in the studio with Charlie Peacock recording their first full length album due out in the next few months. I'm really excited about it and can't wait to hear what they've been cooking up.